This morning I woke up and did something I have been putting off for days, weeks and well, even months if I’m truly honest. Today I started to potty train Tigger… my parenting nightmare (well other than sick, oh how I cannot deal with vomit). Anyway, so after reading many books from the library, speaking to friends and family members and trying my best to remember how on earth I managed to get Roo potty trained, I decided enough was enough and it was time for Tigger to start on his potty training journey. After all the advice I have read or been kindly given (an online thank you to Mummy Matters and PinkOddy *mwah*) I decided that pull ups were not a route I was going to go down. I vaguely remember using them with Roo and quite frankly it just confused her too much so this time we are going cold turkey. First time potty trainers can easier be fooled into thinking that a potty is just a potty… wrong! 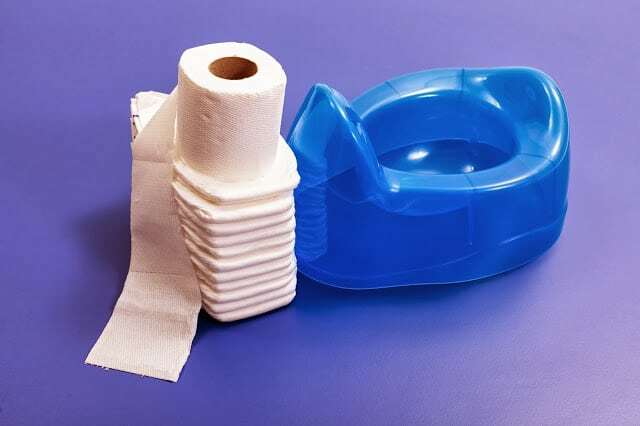 There are so many different types of potty’s on the market that walking into your favourite baby department you could quite easily get bewildered by which one is best for your little one. So how do you chose your perfect potty? In reality all of these options are right, it all goes down to which option works best for you. When I was heavily pregnant with Tigger I was fortunate enough to win a Pourty Potty via a blog giveaway and it has sat underneath his cot ever since. That was until today when I got to see the Pourty potty in action and I have to say it is so much easier to empty than other brands I have used in the past. With Tigger I have decided to go cold turkey and not bother with pull-ups. Having previously bought him a selection of Thomas & Friends underpants a few months ago it was time to get them out and see how we get on. So first thing after taking his overnight nappy off I asked him which pair of pants he would like to wear, selecting a pair with his favourite trains; Thomas, Percy and James on. Having only gone through five pairs of pants and one pair of pyjama bottoms I feel we have done relatively well today. Tigger managed two (and a little bit) wee wee’s in the potty for which he received lots of cheering and Thomas & Friends stickers (do you see a theme here?). By late afternoon he was getting a little tired so had two accidents within 10 minutes so thinking that he had done really well for the day I popped a nappy back on him and said we would try again tomorrow. After about 30 minutes he was asking to go on the potty and whilst he had already wee’d in his nappy I still feel this was a success as he asked to go on the potty. After his bath this evening I popped a nappy on for him to go to bed in but he was not happy about it, asking if he could have his Percy pants on. So I simply added the pants over the top of his nappy to keep him happy. Tomorrow however he has nursery so this will be the true test of his potty training. I really wish I was able to take a week off work to get him used to the potty and pants at home but unfortunately the reality is that I am unable to do this so we will just have to see how it goes…. Wish us luck!